While Jack LaLanne (September 26, 1914 - January 23, 2011) is usually given credit for being the first in the fitness industry, he was NOT. His mentor Paul Bragg, obviously started before him. The physical culture movement in America started out during the late 1800s. Other well known figures in the health industry who stressed exercise as part of their health program before Jack would include John Harvey Kellogg and Joseph Pilates. But, Jack LaLanne would certainly be the most successful and longest lived well known modern figure in the health club industry. While health spas can be traced back to ancient Rome and physical culture gyms existed before, Jack is generally credited with creating the modern concept of a health club that revolved around weight machines for working out. For the first time, women could go to one of his gyms and publicly workout. Jack LaLanne is clearly the longest-lived figured in the health club industry, whose age at 96 is NOT in dispute. There is, however, a possible genetic connection to Jack's longevity since his older brother, Norman (1908-2005), actually lived one year longer than him. But, still Jack offers the world the best proof that your quality of life is largely under your own control. Videos of Jack's exercise television program documents what exercise can do for the younger generation. And, we have a lot of videos of LaLanne making public appearances and interviews in his eighties and nineties. Now, compare Jack LaLanne's quality of life to that experienced by the elderly who are forced to use walkers, wheel chairs, and live in nursing homes. What is missing from the public record is more details about his exact health condition. As a health icon, it would have been nice to know more about his muscularity in his nineties. We do NOT even have his height and body weight. Unfortunately, in his later years he switched to wearing a long sleeve body suit which suggested to me that it might have been padded. This was NOT an issue for Joseph Pilates who often walked around his neighborhood almost naked in the snow, wearing only a speedo. How muscular were his strong man's arms at 96, is what I want to know? Steadily and progressively losing muscle mass over the years is a major health issue facing everyone as we age. Exactly, how effective was Jack's exercise routine in retaining his muscularity over the years in at least his arms? Jack LaLanne's Muscularity at 80 years of age. What we do know, however, is that he was at least mobile, lived independently with his wife, and apparently still enjoyed a high quality of life. Jack did, however, have a heart valve transplant operation in 2009 at the age of 95. 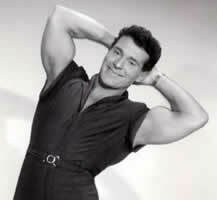 Jack LaLanne dies from pneumonia at 96. His manner of death raises a lot of questions. Details of his death are sketchy. LaLanne reportedly died on Sunday January 23, 2011 at his home in Morro Bay, California allegedly from respiratory failure due to pneumonia. Jack LaLanne's lifestyle worked because he successfully managed to avoid dying from a lifestyle disease. And, always lived his life, his way, right up until the very end. Some accounts have him suffering from a brief illness. Usually pneumonia is a byproduct of another illness. During LaLanne's last days, was he suffering from a known illness? Did he know that he was sick and had pneumonia? Why in the world would a person suffering from pneumonia not be in the hospital? Did Jack LaLanne have something against hospitals and medical treatment in general? Was he just being stubborn and trying to treat himself? Legend has already developed around the events of his death. Jack is widely believed to have died while working out and was reportedly found with a dumbbell still in his hand. Regrettably, I think that Jack LaLanne clearly died before his time. Had he been admitted into a hospital and had received proper medical treatment, Jack could quite possibly have recovered and still be alive today. In retrospect, had Jack LaLanne been aware of the Vitamin D Revolution and also occasionally supplemented with Vitamin A; this health icon would probably never have come down with pneumonia, in the first place. What we all can learn from Jack's death is that he was quite obviously an exercise extremist. While exercise is important, knowing when to check yourself into a hospital is likewise extremely important. It, also, once again points out the serious threat that pneumonia poses to the elderly. While exercise is effective at maintianing a high quality of life, it is NOT the answer to everything. If you want to prevent death from pneumonia then maintaining minimum levels of retinol is very important.